This tasty, one-skillet dish is the perfect solution for busy weeknights...it's got protein, rice and veggies all together, and it's ready in a snap. Heat the soup, water, paprika and black pepper in a 10- inch skillet over medium-high heat to a boil. 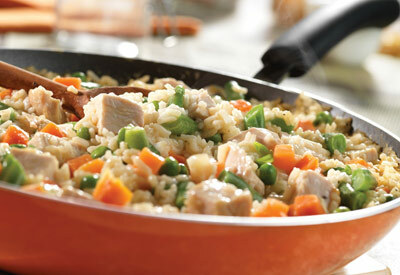 Stir in the rice, turkey and vegetables. Reduce the heat to low. Cook for 5 minutes or until the rice is tender.